Phobos 2... What Really Happened? Phobos 2 was the last space probe designed by the Soviet Union. It was designed to explore the moons of Mars, Phobos and Deimos. It was launched on 12 July 1988, and entered orbit on 29 January 1989. Phobos 2 operated nominally throughout its cruise and Mars orbital insertion phases on 29 January 1989, gathering data on the Sun, interplanetary medium, Mars, and Phobos. Phobos 2 investigated Mars surface and atmosphere and returned 37 images of Phobos with a resolution of up to 40 meters. Shortly before the final phase of the mission, during which the spacecraft was to approach within 50 m of Phobos' surface and release two landers, one a mobile hopper, the other a stationary platform, contact with Phobos 2 was lost. 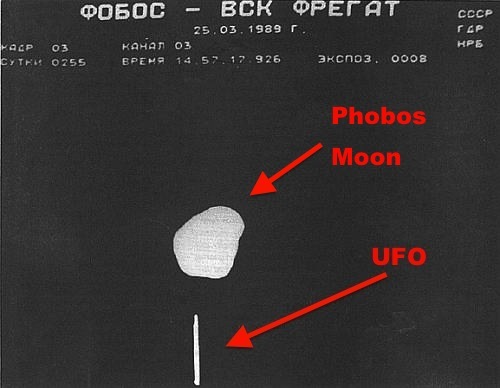 The mission ended when the spacecraft signal failed to be successfully reacquired on 27 March 1989. The cause of the failure was determined to be a malfunction of the on-board computer. "The (Official) cause of the failure was determined to be a malfunction of the on-board computer." "One of the last attempts to photograph Mars along with the Moons was by the "Mars Observer" of NASA, which was launched from Cape Canaveral Air Force. However, NASA also lost contact with the spacecraft." "Communication with the spacecraft was lost on August 21, 1993, three days prior to orbital insertion." Could there be an Alien agenda to keep some Martian secrets from Mankind? 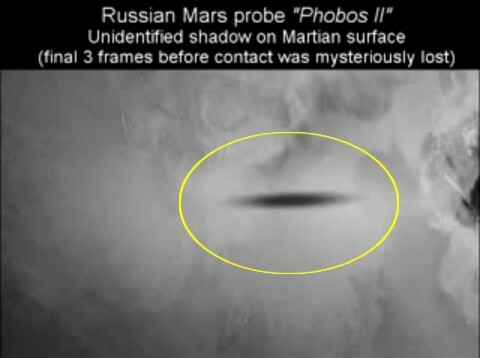 If "Phobos 2" was NOT "shot down"... then what do you think that the photos show? Malfunction of on-board computer. Pretty open and shut. Then what do you think that the photos show? Considering the on-board computer was malfunction, could just be visual noise.